Philips has been out of the audio game for a little while, but 2019 will see it thundering back into the personal and home sound system spaces with a mix of resurrected lines and all-new devices. Most timely of all will be the introduction of the brand’s first stab at true wireless headphones, the UpBeat SHB2505, ready to do battle with the Apple AirPods. 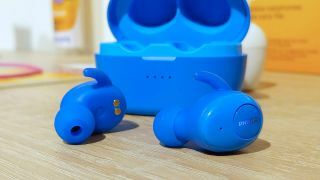 With an affordable price point stated of 99 Euros (which converts directly to around £87 / $115 – with reps promising a sub-£100 UK price point), and available in a range of colors, Philips looks to be courting those enticed by the prospect of a wire-free life, rather than those demanding audiophile thrills. Launching in white, black, blue and purple shades, the UpBeat SHB2505 follows the standard true wireless headphone template, with a pill-box like charging case, complete with LED indicators for battery status. You’ll get 3 hours out of the headphones per charge, with the case holding an additional 9 hours of playback. That’s 12 hours total. We’ve seen longer battery life spans, but at the price point that’s an acceptable concession to make. The UpBeat SHB2505 uses Bluetooth 5.0 and has smart pairing functionality, meaning they’ll connect to your player the instant they’re removed from that magnetically-snapping charging case. Hands-free calling and a mono mode is supported too, if you fancy leaving one ear free for the world around you. It’s one of a few new launches in the audio space for Philips this year, with the company stating that the first 6 months of 2019 will see a gradual introduction of new products alongside a wider range of returning items, before revealing more advanced and innovative devices later in the year. Philips will have a full range of audio products that will include Bluetooth speakers, home systems, clocks, CD players, portable radios, sound bars, and headphones, including the reintroduction of the well-received Fidelio X2HR over ears. Elsewhere, in the first half of the year you’ll find the launches of competitively priced PRO650NC active noise cancelling headphones (rocking the neckband style), 49 Euro PRO6305 in-ears (a striking price for hi-res audio compatibility) and a HTL1510 soundbar that comes complete with a wireless subwoofer. Expect more in the second half of the year, ready for IFA 2019.